From cars to tailoring, from one-off timepieces to customised hi-fi, the demand for made-to-measure creations is returning to levels that rival the boom period of the 1920s and 1930s. At that time we saw the most flashy cars that ever traversed the avenues of Nice, Beverly Hills, Paris or Berlin, and it was also the era of writing instruments that were just as splendid. Those days have returned and Montegrappa welcomes them with ARTE, our new programme of custom pens. 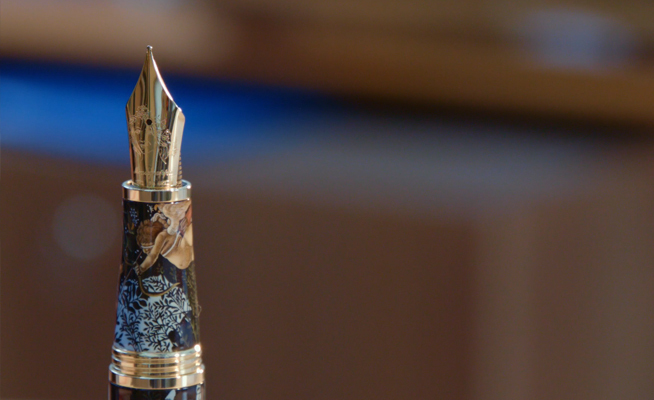 Montegrappa will work closely with each client who chooses to commission an ARTE writing instrument. For such a truly personal object, one that is held in the hand and controlled entirely by the user in a manual fashion, there can be no more individual a presentation than ARTE. ARTE will be available only as a fountain pen, to be decorated according to the individual customer’s requirements. The body and cap, made of precious resin, are to be embellished with incredible hand-painted miniatures on all of their surfaces. Trims are exclusively in solid 18K gold. The ARTE collection also includes one-of-a-kind creations made by our skilled in-house artists featuring world-famous paintings such as the “Primavera” by Botticelli or the "Last Judgement" by Michelangelo, realised in exquisite miniature form, and requiring more than 200 hours of meticulous artisanal work each. 1. Select model among existing or personalised versions. 3. The body of the pen will be hand-painted with an image chosen by the client or the client may order one of the one-of-a-kind models made by our talented artists.